Back-to-school shopping is the second biggest shopping season of the year, with estimated spending at $84 billion for 2018. With apparel, beauty products, and backpacks among the top B2S items, we asked JCPenney to share with GRMA insight into successful marketing campaigns and in-store experiences this season. We thank Marci Grebstein, Executive Vice President and Chief Marketing Officer with JCPenney, for sharing the innovative programs she and her team executed this summer. We’ve launched completely separate Arizona Instagram and YouTube channels to talk to the teen shopper and unveiled an all-new, mobile-first design for the Arizona landing page at JCPenney.com so teens can quickly and easily shop the latest Arizona styles on their phones or tablets. To further elevate our credibility with teens, we’ve partnered with social media stars Brooklyn and Bailey McKnight. With more than 5 million YouTube subscribers and close to 4 million Instagram followers, the identical twin teenagers post about fashion, beauty, friends, and family to their loyal fan base. As Arizona brand ambassadors, they’ve introduced Arizona to the millions of girls and teens who look to their YouTube channel for fashion inspiration. As part of our partnership, Brooklyn and Bailey choose their favorite Arizona pieces from our assortment each season. These curated looks are called out in stores with signage and life-size cuts of each girl. We also have a dedicated landing page on JCPenney.com dedicated to their favorite looks. This is a fantastic traffic driver and encourages their huge fan base to come shop JCPenney. We’ve also launched a custom-designed backpack created by each girl. Brooklyn and Bailey hand-selected a custom-designed Arizona t-shirt, a dry shampoo pen from The Salon by In Style, mini samples from Sephora inside JCPenney, and a piece of Arizona jewelry that represents their own unique aesthetic. 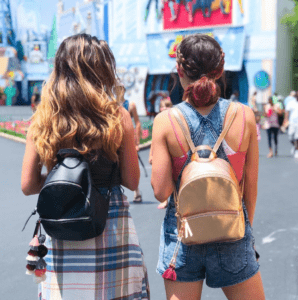 These $25 backpacks became available online only and via the JCPenney app on July 30 and are almost sold out. In early August, Brooklyn and Bailey hosted meet-and-greets in select JCPenney stores, driving even more fans to our stores. Our focus is creating a seamless shopping experience for our customers no matter how they decide to shop with us. Whether they’re shopping with us online, via our app or coming into a physical store it’s all about the omnichannel experience. Today, value isn’t just about price, it’s also about our customers’ time and effort. That’s why we offer convenient services such as ship-to-store, same day pick up, and free in-store returns. Our customers are also taking advantage of our app to quickly access coupons, price check an in-store item and find additional colors or sizes of an in-store item online. We’ve also launched a new initiative, Bonus Bucks, just in time for the back-to-school season. A new addition to our JCPenney Rewards program, Bonus Bucks are a great incentive for customers to shop with JCPenney more often. We hosted Bonus Bucks events every weekend throughout the back-to-school season. For every $50 spent in a single transaction, customers earned $10 in Bonus Bucks, up to three times during the promotional event. JCPenney Bonus Bucks are digitally credited within minutes of a store purchase, allowing customers to earn and spend their Bonus Bucks the very same day. Bonus Bucks are earned in addition to JCPenney Rewards points, adding even more value for members of our customer loyalty program. JCPenney offers in-store services that cannot be replicated online — like salon, Sephora, and optical. For the B2S season, we’re offering kids in grades K-6 $10 haircuts at JCPenney salons through Sept. 15. 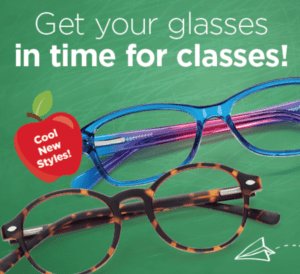 Inside the JCPenney Optical shop, children 16 and under can receive one pair of eyeglasses for $39.99 or two for $69.99, through Sept. 29. And at our Sephora inside JCPenney shops, teens love stopping by for a free makeover and to check out the latest trends in skincare and beauty products.